One of the things that I find fascinating in my role as a Pastor at Edgewood is to occasionally find out what people out there are saying about our church. The truth is that I really don’t know what people outside of Edgewood are thinking and saying, probably because I’m just naturally insulated. People outside of Edgewood just aren’t going to walk up to me and tell me what they’re thinking. No, it’s something other than that…I don’t know how many people say that about Edgewood, but at least a few I suppose, enough that I have heard it more than once through the years from different people who as far as I know are not connected with one another. I’m guessing the idea could be that we’re all about entertainment, maybe because we have contemporary music, or screens, or we laugh and smile and actually enjoy coming to church. More likely I’m guessing that the comment comes from what people think our message is. More likely I’m guessing that a few people put us down as a “feel-good” church because we talk a lot about the gospel here. They wouldn’t put it like that, but that’s probably what it is. The reason the “feel good” message doesn’t lead to more and more sin is that something else wonderful happens to us when we come to Christ: we are placed in union with Jesus. Romans chapters 1 – 5 is about how we are saved through union with Christ. Romans 6 is about how we live holy lives through union with Christ. 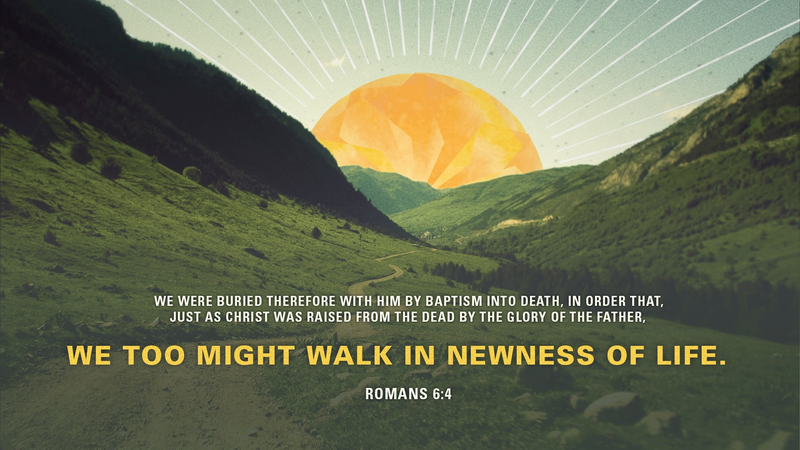 And it happens this way – when you are united with Christ in his death, burial and resurrection, you receive power…power to live for God, power to live a holy and righteous and joyous life, and all in all power to walk…in newness of life.